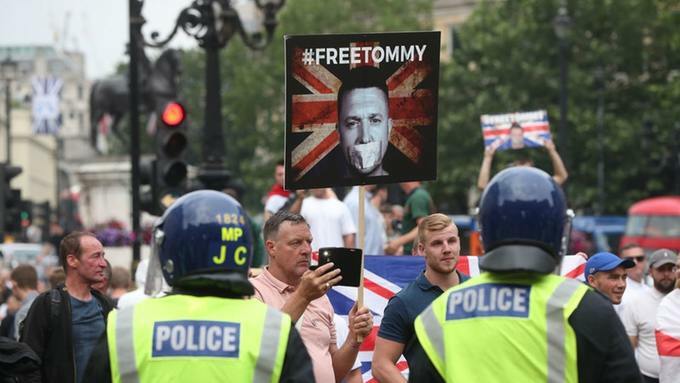 Demonstrations calling for the release of Tommy Robinson took place in several cities in the UK Saturday. Including Belfast, Leeds and central London where a particularly large protest took place in Trafalgar Square. Tommy Robinson was arrested while reporting on the case of an underage grooming gang on May 25. For this he was charged with “contempt of court” and the very next day he was tried and sentenced to 13 months imprisonment. There had been minimal mainstream news media coverage of this case. Fortunately, coverage in the independent online media has ensured that the media silence has not been unanimous, which in turn has forced some of the mainstream media to cover the story. Even that bastion of political correctness the BBC has reported on the protests over Robinson’s case. While the liberal left-leaning Independent reported on the demonstration, describing those taking part as “far-right activists”. Were it not for the internet we seriously doubt that either the BBC or the Russian oligarch-owned Independent would even be reporting on Robinson’s case. The internet has also been responsible for highlighting the fact that Robinson’s trial and imprisonment are essentially political in nature. The “contempt of court” charge is simply a pretext used to get Robinson off the streets and silence him. Through YouTube and the internet he was reaching a new, much wider audience. Prior to the internet this wouldn’t have happened. The charge against him and his imprisonment are obviously meant to curtail his growing influence. Regardless of one’s political views Robinson’s summary arrest, trial and incarceration represent a dangerous development regarding civil liberties. This writer comes from a mixed-race background but it’s obvious even to me that allegations of “racism” are being used to silence Robinson. As well as prevent any reasoned debate about his incarceration. While this writer would question Robinson’s stance on key issues — such as his support for Israel — his trial and imprisonment are very obviously politically motivated. Ed.